It is a well-known fact that the needs of a male and a female body differ but both men and women today are facing vitamin and mineral deficiency due to the poor eating habits and changes in the lifestyle. This indirectly or directly is affecting their all over health and well-being. Vitamins play essential roles in our body and ensure the proper functioning of body systems and energy production. Deficiency of vitamins, in the long run, may lead to chronic disease. If you are a man aged 18-75 years old, make sure you get enough vitamins as well as minerals. Based on the statistics and studies, below we have discussed the essential nutrients men might be missing. Vitamin B12– Many males and females especially vegetarians are deficient in vitamin B12. Also due to certain medications, such as acid-blocking drugs or medications to manage diabetes or blood pressure, there may be trouble in the metabolization or absorption of vitamin B12. Deficiency of vitamin B12 leads to CNS problems and fatigue. Fortified foods such as soy milk, cereals, and meat substitutes. * Vegans who avoid eating animal products such as meat, egg and even milk may find it hard to get sufficient vitamin B12. They are advised to eat fortified foods with added vitamin B12 or vitamin Supplements. Vitamin D- Adults, mostly living in cold climates or indoors suffer from vitamin D deficiency. Men need vitamin D not only to strengthen muscle or bone but also to produce the male hormone testosterone. Also, vitamin D protects brain health, controls blood pressure, cholesterol and prevents depression and mood disorders. Also, vitamin D lowers inflammation. Sunlight is the primary source of vitamin D. Expose your bare skin for just 5-10 minutes 2-3 times in a week to get enough vitamin D.
Foods fortified with vitamin D such as soy milk, dairy, orange juice and cereals. 3.Vitamin A, E and C– Vitamin A, E and C are antioxidants. They fight free radical damage, slows the ageing and prevents diseases such as heart diseases, cancer, vision loss and cognitive decline. Some spices high in vitamin A are paprika, cayenne, red pepper, and chilli powder. Vitamin K- Vitamin k is needed for blood clotting, to prevent heart diseases and build and maintain strong bones. Vitamin K deficiency is common in men who are on antibiotics or other medication for long or men who suffers from intestinal problems such as inflammatory bowel diseases. Also, vitamin K deficiency is common in men who do not consume dairy products or veggies regularly. *Cereals too contain vitamin k in a small amount. There is an old saying “you are what you eat”. Every men should make sure they get enough vitamins from their daily diet. 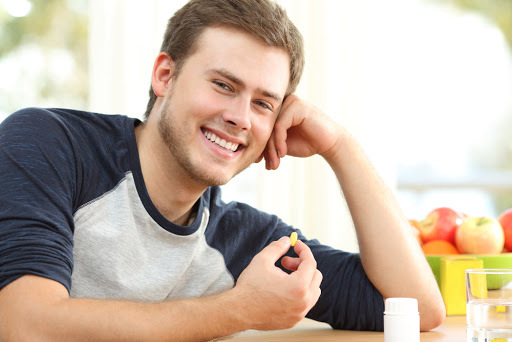 Also, there are a wide variety of multivitamins or vitamin supplements available that are specially designed for men. Choose the one considering factors such as specific health concern or allergies and after consulting your physician.